The Allagash Wilderness Waterway, site of the 1976 UFO sighting. Photo courtesy of Jack Heddon. Mention UFO sightings and many people will think of Roswell, New Mexico and the alleged recovery of an alien spacecraft, complete with occupants, back in 1947. That incident gave rise to government conspiracy theories, a host of books, blockbuster movies, TV scripts and a controversy that continues today. Rather than sweep the alien issue under the rug, Roswell embraces its outer-world image, even having a little green man in the official city seal and “Alien City” as its nickname. You have to admit, it does wonders for the tourist trade. Perhaps Roswell does steal most of the UFO glamour, but Maine also has its tales of visitors from beyond our Earthly realm. So far there has been no evidence of a crash, but in Maine’s remote interior, how would you really know? Those poor little guys could wander about for days finding nothing but moose. And how exactly would they explain those four legged creatures with the impressive headgear to the folks back home? Yet there has been no evidence of moose mutilations, as has been seen with cattle in parts of the United States and Canada. Then again, some parts of Maine are in the middle of almost nowhere. Cynthia Everett, a school teacher in Maine in the early 1800s, kept a diary. The entry for July 22, 1808 went far beyond the usual musings of everyday life. Everett described a strange light that arrived from the east and that seemed to dart back and forth, hover, change altitude and then eventually disappear. For her time, Everett was an educated woman, with knowledge of the sciences and the natural phenomenon of the Earth. Translation, she did not mistake the lights for the Aurora Borealis. There were also no weather balloons back in the fledgling United States to blame for the strange, darting orb. On the eastern side of the Passagassawakeag River is a heavily wooded area. It is visited at night mostly by those looking for a bit of privacy for some stargazing and/or other extracurricular activities. During the last three months of 1968, some of those sitting about in their cars got more than they bargained for. Saucer shaped UFOs made multiple appearances, apparently attracted by the high tension power lines running through the nearby field. Witnesses saw the craft hover over the lines, spin and then leave. This was repeated over and over again. Witnesses reported seeing smaller lighted objects falling from the bottom of the UFO, seeming to transfer power from the lines to the craft. As soon as the “transfer” was complete, the craft sped away into the night skies. UFO theorists have suggested that aliens are attracted to our power sources, such as nuclear plants and high-power electrical wire. Sightings appear to be more frequent around these structures, particularly if they are in lightly-populated areas. Can it be that aliens view Earth as a recharging station, making regular stops to “fuel up” like one giant electric car? Do the increased sightings in 21st century Maine and elsewhere mean these intergalactic freeloaders have discovered that we now have electric cars? Imagine what fun they’ll have once recharging sites for those cars are set up coast to coast. 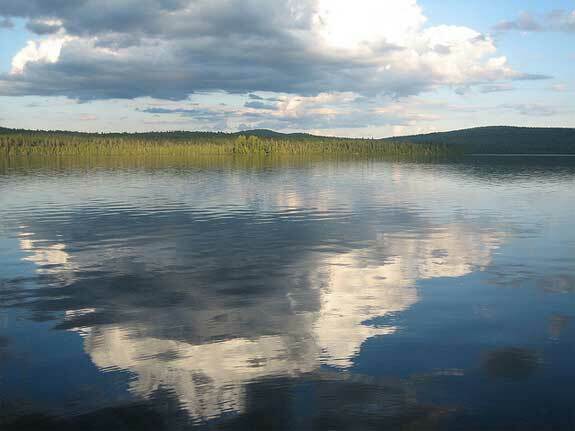 Probably the most famous UFO sighting was at Eagle Lake, part of the Allagash Waterway in northern Maine. Four men, brothers Jack and Jim Weiner, Charlie Foltz and Chuck Rak decided to take a canoeing and fishing trip in this remote part of the state. Their first day of fishing didn’t go so well so they decided to paddle out and see if the fish would bite at night. Unfamiliar with the area, they built a giant campfire to mark their campsite and then set off. As they fished out on the lake they watched a very bright object appear over the trees. It was round, changing colors from red to green to yellow as it darted about. The men aimed their flashlight at the object, and flashed an SOS signal. Big mistake. The object came straight for them shining a beam of light back at them. All of a sudden, at least to them, the men were back at their campsite. The object was hovering, then sped up and disappeared. Several nightmares and counseling sessions later, the men realized they had been abducted. The experience was fuzzy, like a dream out of focus, but since all were artists they were able to sketch their experiences. Basically they remember creatures with large eyes doing some embarrassing physical examinations. The Allagash Abductions have never been explained, nor discounted. The televisions show “Unsolved Mysteries” also featured the story on an episode. Why Are UFOs Interested in Maine, and Us? Why were the aliens attracted to Eagle Lake? Perhaps they were regular visitors to the Allagash and the giant campfire seemed out of place. Like Earth scientists, they might have come down to have a look. As far as the samples, is it any different than oceanographers tagging whales or taking skin samples from manta rays to learn more about those creatures? So far aliens haven’t attached critter cams to us humans, as far as we know. They probably can just tap into our cell phones. We humans have a love/hate relationship with UFOs and alien beings. The government flat out denies their existence. Scientists, except perhaps astronomers, are pretty much on the fence about the whole thing. Artists, science fiction writers and movie goers embrace the concept of life beyond out solar system. “Star Trek” captured our imaginations in the 1960s and still holds them. Spock even has an official home town on Earth, in Vulcan, Alberta, Canada. Captain Kirk even parked a replica of the Enterprise in front of the Space Station Tourist Center. Maine has yet to name an official alien welcome center, or paint flying saucers on hockey rinks or open a hotel with a “Star Trek” room, which we know of. But the state is blessed with countless acres of remote forests and hundreds of hidden lakes that mirror the full moon on a cool, clear night. Add to that the electric high-power lines that traverse the state and you have one giant alien welcome mat. Then there is the moose. Perhaps the aliens hanging around Earth in the mid 1960s caught an episode or two of the “Rocky and Bullwinkle Show” and decided that Bullwinkle, the moose, was the most interesting character. The aliens chose Maine because there are so many moose and they are searching for their celluloid friend. Trouble is, they have to keep coming back because so far they haven’t found one that walks on two legs and talks. As far as we know.